Selection poser: Will Pontus Jansson be back in the Leeds United team at Reading? The run-in starts here for Leeds United as they face their final group of regular season EFL Championship matches hoping for a successful finish. Success would mean one of two things – a play-off place, which looks well within their reach now or an automatic promotion place that is more of a long shot with eight and nine points to make up on Brighton and Newcastle. The fact that at this stage of the season you would not be completely laughed out of court saying that Leeds could be promoted is a measure of how far they have come under Garry Monk and the long suffering supporters certainly have plenty of excitement and, probably, tension to look forward to in the final six weeks. In that period they face eight matches, with the first three of them in eight days as they return from the international break with a bang and the opportunity to take a giant stride towards the play-offs at least. No doubt there will be plenty of twists and turns to come, but if the Whites can win at Reading on Saturday evening and at Brentford next Tuesday many will feel they have one foot in the play-offs. They are expecting a particularly tough game, however, in the first of those games with their hosts one of their biggest rivals in the hunt for a top six finish. Leeds have come up with the results in recent matches with Brighton and Sheffield Wednesday when much was at stake and they raised their game for the fixtures. They came within seconds of a win too on the trip to another of the contenders, Fulham, although the performance that night was not so impressive. They will also be looking to do the double over Reading, having beaten them 2-0 at Elland Road in December with goals from Chris Wood and Souleymane Doukara so should not be lacking in confidence on their travel to the Madejski Stadium for another of Sky’s Saturday early evening live games. 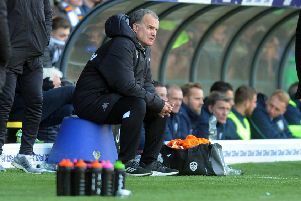 Just two points and one place in the table separate the teams going into the fixture so its importance cannot be underestimated and giving the game a little added spice is the fact that there was no love lost between the two respective team bosses after the meeting at Elland Road when Reading had dominated possession, but Leeds carried the bigger goal threat. In his after match comments Reading manager Jaap Stam said that United’s playing style was not his “cup of tea” and he disputed Monk’s claim that Leeds had been worthy winners and was clearly upset at the “boring, boring Reading” chant that came from the home crowd as they saw him team virtually pass the ball to death with their 77 per cent possession tally. But Stam has seemingly sought to diffuse the situation ahead of the return game, saying last week: “Next we have Leeds who are a quality team doing very well.” With his Manchester United past he can still expect plenty of banter aimed at him from the travelling supporters, however. Leeds expect to be close to full strength for Saturday’s big match, although Luke Ayling will sit out the second match in his two-match suspension. Much of the team selection interest will be centred on whether Monk restores fans favourite Pontus Jansson to his centre-back position after admitting he dropped him for the Brighton match. He played well for Sweden in their 4-0 win over Belarus, while his deputy in the last game, Liam Cooper, was an unused substitute twice for Scotland.